What makes our villa holidays stand out from the crowd is that you can snap one up for just £60pp deposit. That means you can secure your ideal villa holiday, as soon as you set eyes on it. We like to make things nice and easy for you. Once you’ve paid your deposit, how you pay the rest is up to you. Pay what you like, when you like, up to ten weeks before you go. Don’t worry about sorting out your own hire car – we’ll do it for you. All included in the price. Pick up your hire car when you land, then get out and about with comfort and ease. With lots of late morning flights, you don’t have to worry about super-early starts. We’ve plenty of early evening flights back too, so you can make the most of your last day away. Pack more in – a massive 22kg per person. It’s more than enough for you to take everything you need to get the most out of your home-from- home holiday. You can tailor your holiday to suit you, with villas ranging from laid-back to lavish. We offer three types – from individual villas, to hotel resort villas that make the best of both worlds. From the scenic shores of Spain and its islands to the dramatic landscapes of the Algarve and Greece, we’ve got your ideal villa in some of Europe’s best-loved destinations. All of our villa holidays are ABTA and ATOL protected to ensure you and your money are secure. That way, you can concentrate on looking forward to your villa holiday. 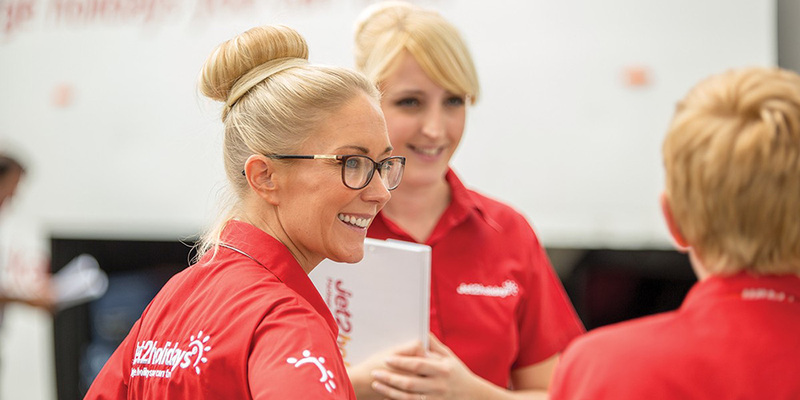 Our Customer Helpers are on hand to help you 24 hours a day, 7 days a week. They’ll leave you in peace to have a great time, but you can contact them any time to help with anything you need. Holidays are even better when the kids go free. That’s why we’ve made sure there are plenty of Free Child Places to snap up at our most popular villas. Be sure to grab one before they go. Even the smallest members of the family can get in on our great-value villa holidays. That’s because all infants under two years old go for free, which means even more savings for you. As well as a huge 22kg baggage, you’ll also get a generous 10kg of hand luggage – perfect for bringing all the essentials you need to keep with you during your flight. Our sister company, Jet2.com was named Best Airline – UK and Best Low Cost Airline – Europe at the TripAdvisor Travellers’ Choice Awards. It’s also the only UK airline that’s a Which? Recommended Provider. Our villa holidays include return flights with our sister company, Jet2.com. Thanks to this, we can offer you more flexibility with shorter and longer stays, plus everything in-between.